Occupational safety during welding is prescribed by law. To this day, however, some companies still use no effective equipment for occupational safety such as extraction plants. We are talking to Marco Baumgärtner about what he finds out when visiting companies, how he conducts conversations and what the trends are. 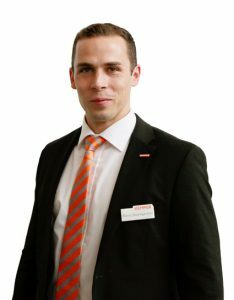 The Area Sales Manager for Southern Germany in interview with KEMPER GmbH. When it comes to occupational safety, one would think that companies are really well informed these days. What are your experiences? My experiences are dichotomous. Of course, there are exemplary companies who stick to high standards regarding occupational safety – specifically if they have a responsible management team or if the works council represents the welders’ interests. Yet, there are still the exact opposite types of companies. What do you come across in these cases, when you get in touch directly with these companies? It is even often the case that these companies have a welding fumes extraction system for occupational safety. However, this is often so outdated that the use of the extraction technology would be very impractical. This is what the companies then like to tell me. Naturally, this is not a real argument against occupational safety in their own production. How do you argument back? That often depends on how unwieldy the occupational safety equipment for the welding process really is. We then introduce our extraction arms to show how flexible modern cantilevered solutions are. This is usually the first lightbulb moment. Occupational safety is simply not the main purpose of metal processors. 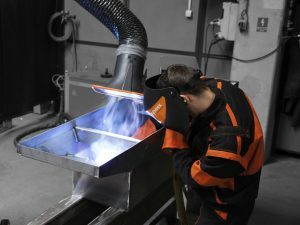 Developments in welding fumes extraction are just glanced at in passing – specifically in smaller companies. Once companies then check out the references, they quickly realize what is possible today. We have to do quite some convincing. And surely with all the risk in general. What is the general knowledge of occupational safety in those companies? There are two sides even here: On the one hand, I meet with well informed contacts who are safety officers in companies who e.g. read our blog regularly or read the relevant brochures published by associations. On the other hand, the knowledge with regard to hazardous substances in welding fumes is often really terrible. What are the kind of statements you hear? “What do you mean, this is poisonous? !” is something we hear rather often. Accordingly, investment into occupational safety is rather small. When the welder then develops respiratory problems, the statement is often: “He smoked too much.“ (Comment by the Editors: For estimates regarding the correlation between smoking and cancer risks for welders check here) The companies look for the easiest route here. Occupational physicians can detect the hazardous substances of welding fumes, which have nothing to do with smoking, simply by analyzing the welder’s urine. Illnesses are still only an occasional event for those careless companies. On Monday, the welders mostly feel better again. Illnesses caused by welding fumes without occupational safety have to be considered for the long term. Let’s consider the hazardous substance asbestos. In the past, this was used for buildings everywhere – until 1988 you could breathe in the substance all the time, 1989 it was banned. That was more than 25 years ago! Only now have we reached the peak mortality due to the long-term consequences of asbestos poisoning. 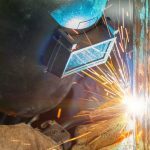 This can also be applied to welding fumes: If the welder comes into contact with the hazardous substances once, then this is hardly too damaging. In the long run, however, it will have a severe impact. Many companies – and we are back here with the positive examples – know the real cost of lacking occupational safety. One of my clients has projected the costs for each missed workday of a welder: He came to 800 Euro per day. Companies should consider if it is really worth shying away from investing in occupational safety. What are the reasons why companies approach you for occupational safety solutions? Companies have mainly three reasons why they want occupational safety: First of all, companies approach us if they were audited by the professional association. The probability, that such an audit comes to a company is really rather small. Normally there are just so many companies in a professional association area looked after by one professional association auditor. Second, metal processors want to optimize their occupational safety further since an initial consultation did not have the desired success. Thirdly, and that is without a doubt the decisive argument, companies realize that occupational safety is key to fight the shortage in professional staff. Occupational safety for example in the form of a room ventilation system cleans the production facility effectively. New employees ask for cleanliness in the factory halls – and naturally also for occupational safety equipment for air purification. So would you say, that there is a change in thinking regarding occupational safety? Absolutely, I consider this non-commitment to occupational safety as an intergenerational issue. In companies, where occupational safety is prioritized, the next generation of welders is already part of the middle management. Long-serving business owners sometimes work along the principle: We have always done it this way – but naturally this does not work for occupational safety. But actually, I do experience situations where the founder still runs the company and the pressure comes from bottom to top. One company, had absolutely no occupational safety for a long time. The boss thought it was also absolutely right. However, at some point five welders teamed up and actively called for occupational safety. Otherwise, they would have left the company. At the end, the boss relented and invested in occupational safety. What are the occupational safety trends for welders? Local extraction is an essential feature. Flexible extraction arms are more in demand now than ever. Hall ventilation is up and coming as a supporting measure for occupational safety. It is no longer just about the individual welders but more to keep the entire indoor air free from pollution. We always recommend it as a supplement to the local extraction. The topic of room ventilation systems is also in the spotlight since companies are obliged to observe the Occupational Safety Law and thus the prescribed dust limit values. 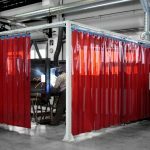 Are there any other developments for welding fume extraction in the market? Yes, of course. Burner integrated local extractions have become more and more important in Germany for the past two years. Previously, they were disadvantageous due to their weight, difficult handling and the relatively low extraction rate. Recent developments reduced weight significantly and makes handling simpler. 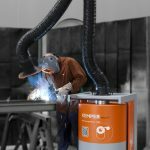 Forced control extraction devices such as burner integrated welding fumes extraction are naturally beneficial as the welder does have no other choice than using the welding fumes extraction system. When you hear the arguments for effective occupational safety, then it becomes clear that metal processors should invest in it today. Do you have some more examples? There are actual examples of companies who had to pay high amounts of compensation after industrial tribunals. The situation was like I described above: little to no occupational safety and long-term consequences caused by welding fumes. In the end, we are also not talking about peanuts, but in some cases about five-figure sums.